On Gringo Star’s latest, liquid melodies cascade through air like a waterfall in zero gravity, brothers Nicholas and Peter Furgiuele out-of-body—floating apparitions of a band glancing down as their corporeal manifestations radiate celestial blues and psychedelic garage bangers, gritty R&B shuffles and spaghetti-Western weirdness. Floating Out to See could—and should—be the soundtrack to Tarantino’s first sci-fi film. 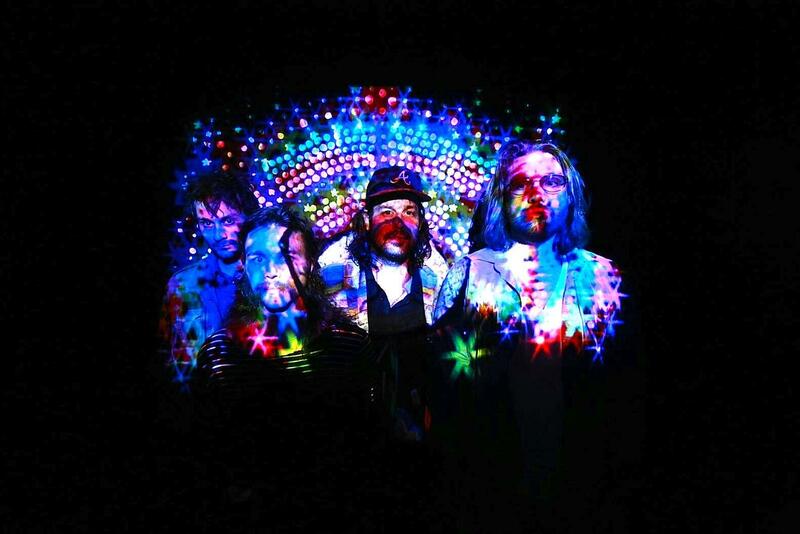 As the album’s title suggests, Gringo Star are insouciant explorers, tossing the paddles overboard and drifting on the currents of their lackadaisical curiosity across a rippling sonic ocean, out to the far edges of rock & roll. Shot pulsing from a vintage Leslie speaker, their guitars, keys and vocals pirouette across the astral plane, the psychoactive ingredients of their echo-slathered, doo-wop-indebted indie gems. Santo & Johnny, The Stooges, Ritchie Valens, Marc Bolan, Percy Faith, Sam Cooke, the men working on the chain gang—uh! ah!—they’re all here, their electric ghosts reaching across time, tapping Gringo Star on the shoulder like the crossroads devil to Robert Johnson, bestowing secrets, passing torches. Floating Out to See plays like a long-forgotten polaroid excavated from the bottom of some mysterious thrift-shop bin, scanned into a computer, emailed to your smartphone and Instagrammed with a nice washed-out filter—a shimmering post-War daydream plucked from the mid-20th century and dropped wide-eyed into the hyperlinked now. No other group today so effortlessly distills the essence of nascent rock & roll into something so entirely modern yet authentically, spiritually tethered to the past. A few years later, in 2001, with Peter still in high school, they started their first serious band, A-Fir-Ju-Well, and released their debut record on International Hits. During the second half of the decade, they formed Gringo Star and dropped a pair of lauded records—2008’s All Y’all and 2011’s Count Yer Lucky Stars—both engineered by James Salter (Black Rebel Motorcycle Club) and helmed by sought-after producer Ben Allen (Animal Collective, Gnarls Barkley, Deerhunter). Since then, the band has toured relentlessly across the U.S. and Europe building a diehard underground following while sharing bills with everyone from Cat power and Feist to The Black Angels and Weezer, and also touring with Wavves, Best Coast, And You Will Know Us By The Trail of Dead, The Toadies and fellow Atlantans The Black Lips. It’s no mistake that the final track on the new Gringo Star album is called “The Start.” Because this ending marks the beginning of a new era for the band. They’ve paid their dues over the last decade, weathering multiple lineup shifts and the often-brutal gauntlet of the road on two continents separated by thousands of miles of ocean, building their following the old-fashioned way; they’ve studied in the studio with the masters, and they’ve set out on their own intrepid sonic odyssey, returning with the blinking-light palette of esoteric sounds and unforgettable hooks that comprise their infectious new record, Floating Out to See. And now, they’re riding this slowly cresting wave toward what looks a whole lot like a breakthrough.